All electrical installations deteriorate with time and should be inspected and tested every 3 to 10 years. Such safety checks are commonly known as ‘periodic inspection’ or ‘domestic electrical installation condition report’. Tests are carried out on wiring and fixed electrical equipment to check that they are safe. A schedule of circuits is also provided, which is invaluable for a property. New – where the whole installation has been installed as new, if a complete rewire has been carried out. Addition – applies if an existing installation has been modified by adding one or more new circuits. Alteration – applies where one or more existing circuits have been modified or extended (for example to add a socket), or items such as a consumer unit (fuse box) and switching equipment have been replaced. 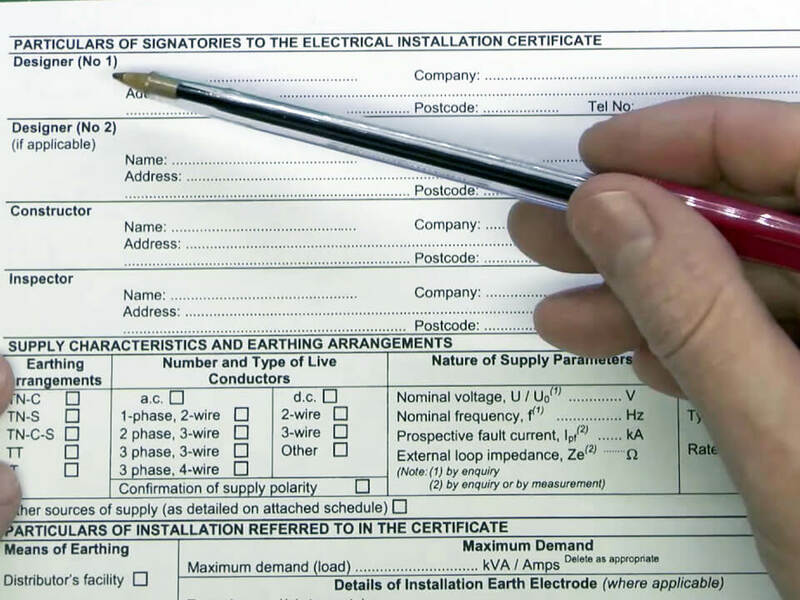 An Electrical Installation Certificate must be issued for all new electrical installations. It may also be required for an alteration or addition to the installation – depending upon whether or not a new circuit has been installed. Where an alteration or addition is carried out but does not include a new circuit, a MEIWC or an EIC may be used. When any new single circuit or multiple circuits are being added to any installation that already exists. When there has been any alteration to a circuit and that alteration has required a change to the protective device. Following initial verification, and after a full inspection and testing procedures have been undertaken, the Electrical Installation Certificate has to be completed. This is something that is required by law. Who can apply for Electrical Installation Certification? Property owners, electrical contractors and licensed wiremen can apply to have their electrical work inspected and certified. The Minor Works Certificate is intended to be used for additions and alterations to an installation that do not extend to the provision of a new circuit. Examples include the addition of a socket-outlet or lighting point to an existing circuit, the relocation/replacement of a light switch etc. This Certificate may also be used for the replacement of equipment such as accessories or luminaries, but not for the replacement of distribution boards or similar items. Appropriate inspection and testing, however, should always be carried out irrespective of the extent of the work undertaken. The engineer must have full access to the board; any obstructions must be removed prior to the test. Board location must be provided to the office prior to the test to ascertain whether the engineer needs ladders. PAYG meters must have enough credit in order for the engineer to conduct the test. Any damaged fixed fittings must be identified prior to the test; broken light switches, cracked sockets etc. All sensitive equipment must be unplugged prior to the test. It is imperative for the Fuse board to be marked up; all relevant circuits must be identified correctly in order for the engineer to carry out the inspection. If at any point the engineer believes the installation to be in an unsafe condition the test will be stopped and recommendations will be made to the customer for improvements which may be needed. Landlord electrical certificates are an important part of ensuring the safety of your tenants and being able to prove that you have taken reasonable steps to do so. It is recommended that you should have a full electrical inspection carried out every three to five years dependent on previous inspection advise. This examination investigates the state of the electrical wiring throughout the property and thoroughly checks the safety of the electrical installation. Once this is done and processed an ‘Electrical Installation Condition Report ‘ will be than issued electronically. It will declare if the electrical installation is safe or if any remedial work is required to ensure it meets current safety standards.